How you start your career is an important determinant for future financial success. 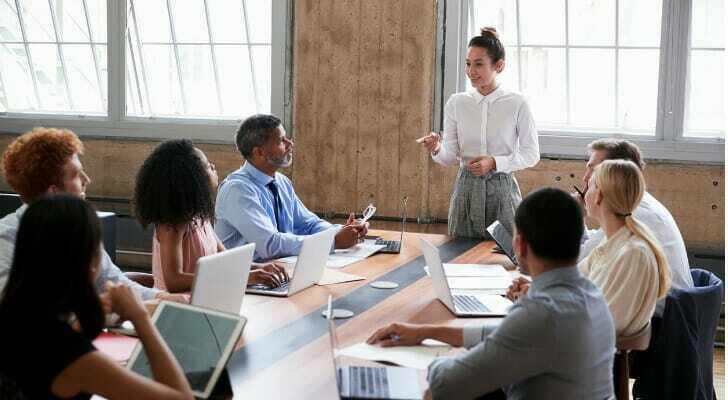 Young professionals who are able to find a high-paying career earlier are able to build more savings, get promoted earlier and have more long-term, financial flexibility. Where you start is also important. Some cities have affordable housing that allows young professionals to invest in the housing market or lets them rent while investing their savings with a financial advisor. Other cities offer a wide range of job opportunities, meaning young adults are not stuck in dead-end jobs they don’t enjoy. Below we look at these and other factors to determine the best cities for young adults. In total, we looked at nine metrics: percent of residents between the ages of 25 and 34, the unemployment rate for young adults, the labor force participation rate for young adults, median rent, entertainment establishment rate, job diversity, median earnings, earnings change over time and median housing costs as a percent of median earnings. 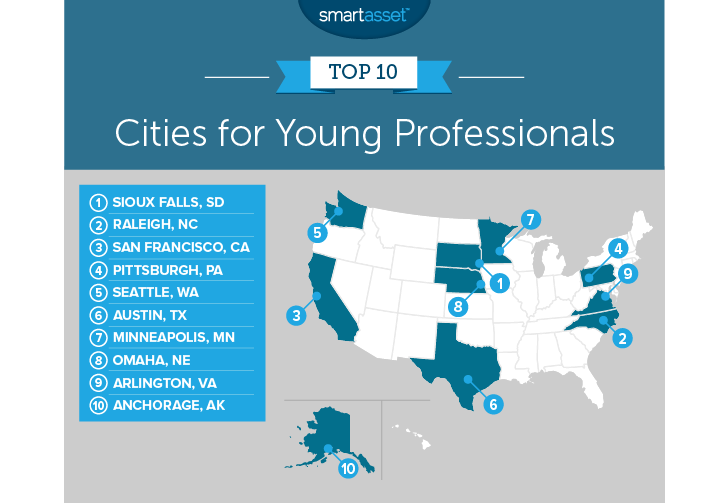 This is SmartAsset’s second annual study on the best cities for young professionals. Check out last year’s version here. Options exist everywhere – No matter what part of the country you are in, there should be at least one great city for young professionals. Within our top 20, every part of the country is represented. If you like the Northeast, give Jersey City, New Jersey a shot. If you prefer life on the West Coast, moving to Seattle or San Francisco could be a good option. Sioux Falls, South Dakota; Minneapolis, Minnesota; and Omaha, Nebraska score well in the Midwest, while the South has Arlington, Virginia; Atlanta, Georgia; and Nashville, Tennessee all ranking in the top 20. Lots of overlap – Six of last year’s top 10 finished in the top 10 this year. The most impressive scorers were Sioux Falls, South Dakota; Seattle; and San Francisco, who all kept spots in the top five. For the second straight year, Sioux Falls takes the top spot as the best city for young professionals. Jobs here are more than plentiful. According to our data from the Census Bureau, young adults have an almost implausibly low unemployment rate of 1.49%. That is the lowest of any city we analyzed. In fact, the labor market is so strong here that almost every young adult participates in the labor market. According to our estimates, 90% of young adults (those between the ages of 25 and 34) participate in the labor force. Sioux Falls’ biggest edge over its competitors may be its affordability. According to Census Bureau data, the median full-time worker would only need to dedicate 23% of his or her income to afford the median rental. 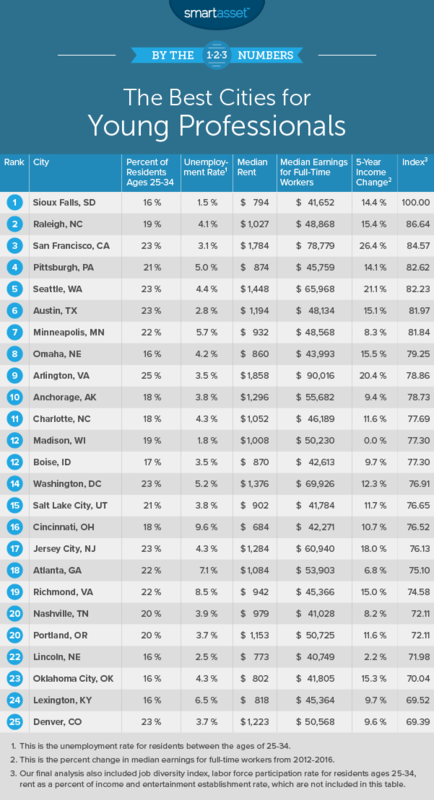 Sioux Falls ranks 14th for that metric. Raleigh, North Carolina jumps from outside the top 25 last year to inside the top 10 this year. This North Carolina city has a robust labor market with 89.8% of young adults either working or looking for work. Our data also shows that pay is pretty good. The median full-time worker earns nearly $49,000 per year, which is a top 30 rate. You can probably expect that number to continue rising too. From 2012 to 2016, the median full-time worker saw earnings rise by 15%. Housing here also won’t break your checking account. According to our data, the median full-time worker could afford the median rental with only 25% of his or her income. If you’re looking for a young, hip city where there is potential for high salaries, San Francisco is a good place to check out. This city has the third-highest proportion of young adults in the study, the fourth-highest median earnings for full-time workers and the fastest growth in earnings for full-time workers. The only problem with living in San Francisco is the enormous amount of worker’s earnings go to the landlord. The median rent here costs nearly $1,800 per month or 27% of median earnings for full-time workers. Pittsburgh is a traditionally undervalued city, according to our past research. Once again, we find that Pittsburgh is a competitive city across livability and economic measures. Pittsburgh has one of the younger populations in our study, a factor that pushes it up the ranks. Nearly 21% of residents here are between the ages of 25 and 34. Pittsburgh is also very affordable in both absolute and relative terms. The median rental costs only $874 per month, equivalent to only 23% of earnings for the median full-time worker. Seattle is one of the most popular landing spots for moving millennials. Perhaps enticed by the fact that Seattle is one of the best cities for coffee lovers or by the expanding tech scene, Seattle’s population now skews pretty young. Census Bureau data estimates that 23% of residents in Seattle are between 25 and 34. There also seem to be good work opportunities in Seattle with more than 91% of young adults participating in the labor force. Seattle suffers from some of the same problems as San Francisco, however: high earnings eaten up by high rents. The median rental here costs $1,450 per month while the median full-time worker earns $66,000 per year. Texas’ capital comes in sixth. This city has a solid economic base from which young adults can launch a successful career. This city ranks in the top 15 for four metrics: percent of residents who are young adults, unemployment rate for young adults, labor force participation rate for young adults and percent change in median full-time earnings from 2012 to 2016. Unfortunately, rent here is fairly expensive. The median rental costs $1,200 per month, That’s roughly 30% of earnings for the median full-time worker. Last year’s runner-up kept a top-10 spot but fell to seventh. Working conditions for young adults in Minneapolis aren’t bad. This city has the fourth-highest labor force participation rate and the median full-time worker here earns more than in 70% of other cities. One concern is the unemployment rate, which is slightly high for young adults at 5.7%. Other good news is the high density of entertainment establishments in Minneapolis. This city ranks 32nd in that metric. The earlier that young professionals can start saving, the more prepared they will be for retirement. Omaha offers young professionals plenty of chances to save. The average rental here costs only 23% of the median full-time worker’s income. The rest of one’s money could go towards saving for a down payment or future investments with a financial advisor. For young professionals who want to stay in the city for years, Omaha offers other good news as well. From 2012 to 2016, median earnings for full-time workers increased by 15%, a top-10 rate. Arlington, Virginia makes sense for young professionals who know what they want to do and are looking to settle down early. This city has the highest proportion of young adults in our study and the third-highest labor force participation rate. In fact, this city has the highest median earnings for full-time workers, a figure that grew 20% from 2012 to 2016. Unfortunately, Arlington does not have a ton of variety when it comes to jobs and isn’t exactly a party town. This city ranks in the bottom half for job diversity and for the density of entertainment establishments. Renting here is also expensive. The Census Bureau estimates that the median rental in Arlington costs nearly $1,900 per year. Anchorage takes the last spot in this top 10. It has one of the most diverse job markets in the country, ranking 28th in that metric. Other positives for Anchorage are the a low unemployment rate for young adults and high median earnings for full-time workers. In both of those metrics, Anchorage ranks in the top 25. One major concern is rent. According to our data, the median rental would cost 28% of the median full-time earner’s income. Percent of population between ages 25 and 34. Data comes from the Census Bureau’s 2016 1-Year American Community Survey. Unemployment rate for young professionals. This is the unemployment rate for residents ages 25-34. Data comes from the Census Bureau’s 2016 1-Year American Community Survey. Labor force participation rate for young professionals. This is the labor force participation rate for residents ages 25-34. Data comes from the Census Bureau’s 2016 1-Year American Community Survey. Median gross rent. Data comes from the Census Bureau’s 2016 1-Year American Community Survey. Entertainment establishment density. This is the percent of all establishments in the area dedicated to arts, entertainment or recreation. Data comes from the Census Bureau’s 2016 County Business Patterns Survey. Job diversity. This measures the variety of industries available in a city. We used the Shannon index to calculate this figure. A higher number indicates a more diverse job market. Data comes from the Census Bureau’s 2016 1-Year American Community Survey. Median earnings. This is the median earnings for full-time workers. Data comes from the Census Bureau’s 2016 1-Year American Community Survey. Five-year change in median earnings. This is the percent change in median earnings for full-time workers from 2012 to 2016. Data comes from the Census Bureau’s 2016 and 2012 1-Year American Community Surveys. Median rent as a percent of full-time workers’ earnings. Data on median rents and earnings comes from the Census Bureau’s 2016 1-Year American Community Survey. First, we ranked each city in each metric. Next we found each city’s average ranking across all of the metrics, giving each metric equal weighting. We used this average ranking to create our final score. The city with the best average ranking received a score of 100. The city with the lowest average ranking received a score of 0. Make tax-friendly investments – When you’re investing for retirement, make sure you contribute as much as you can to your 401(k) or your IRA. This will lower your overall tax burden and increase the amount you can save. Scout out affordable places to retire – Bureau of Labor Statistics data shows that the average household cuts spending by about 25% in retirement, but by moving somewhere with a low cost of living, you may be able to cut expenses even further. Every dollar you don’t spend in retirement is one you don’t need to save while you’re working. Talk to an expert – Anytime you are investing or planning for the future it’s a good idea to get the best advice possible. A financial advisor can explain all your retirement options to make sure you are on the path you want. If you don’t know where to find one, check out SmartAsset’s financial advisor matching tool. It will pair you with up to three local financial advisors who fit your specific needs.